Location-based Services (LBSs) are mobile services for providing information that has been created, compiled, selected or filtered under consideration of the users' current locations or those of other persons or mobile devices. The typical examples are restaurant finders, buddy trackers, navigation services or applications in the areas of mobile marketing and mobile gaming. The attractiveness of LBSs is due to the fact that users are not required to enter location information manually but are automatically pinpointed and tracked. 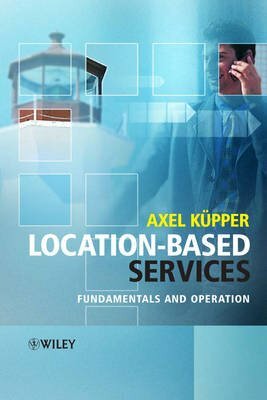 This book explains the fundamentals and operation of LBSs and gives a thorough introduction to the key technologies and organizational procedures, offering comprehensive coverage of positioning methods, location protocols and service platforms, alongside an overview of interfaces, languages, APIs and middleware with examples demonstrating their usage. It provides an explanation and comparison of all protocols and architectures for location services.It offers in-depth coverage of satellite, cellular and local positioning. It provides an all embracing introduction to 3GPP positioning methods, such as Cell-Id, E-OTD, U-TdoA, OTDoA-IPDL and Assisted GPS. It explains the operation of enhanced emergency services such as E-911. It identifies unsolved research issues and challenges in the area of LBSs. This comprehensive guide will be invaluable to undergraduate and postgraduate students and lecturers in the area of telecommunications. It will also be a useful resource to developers and researchers seeking to expand their knowledge in this field.